We are happy to introduce, Wayfare Wellness, a new FiG client. Wayfare Wellness was a part of a downtown medical clinic operating under a different name, and they recently decided to branch off on their own. Our new client specializes in massage therapy to enhance the patient's quality of life. Massage therapy contributes to injury recovery process, improves range of motion, softens inner scar tissue, and delivers overall therapeutic revitalization of the body’s muscles. Leaving an established business to go out on your own is a challenge on its own. Wayfare Wellness also had the additional challenge of making a clear separation from the old clinic. FiG's first assignment in this complete branding project was naming the new business. When a company is starting from a completely clean slate, we start with a new name. The name is the foundation of the new brand upon which all the other elements rest. The client’s business focus is on massage therapy as a path to medical results rather than a relaxing spa service. However, the client no longer wanted to be associated with a medical clinic. We needed to steer clear of both clinical sounding names as well as anything that suggested a spa. With this directive in mind, FiG conceptualized four company name concepts. Each name encapsulated a concept that resonated with a different area of the client's business. Concept 1: Location based or a regional descriptor. A mountain reference symbolizes movement, overcoming challenges and obstacles and insinuates office location is within a region of a mountain range. The FiG team constructed the name Cordillera Movement. Cordillera is a chain of mountains, and Movement refers to the body benefits with massage therapy. Concept 2: Rejuvenation and wellness. Massage therapy has many benefits to the human body. Studies have shown more and more that the route to recovery partners “conventional medicine and complementary medicine.” FiG created the name Renewell Massage, which is a play on the two words renewal and wellness. Concept 3: Journey to wellness. A wayfarer is a person traveling on foot. This concept proposes that through routine massage therapy, a person is on their journey to wellness. The name FiG cultivated for this concept was Wayfare Wellness. Concept 4: Literal description of the business. FiG came up with Progression Health to depict the patient's advancement to better health. The client had some time to ruminate on the concepts, and they chose Concept 3 and the name Wayfare Wellness. Wayfare Wellness wanted an old-time apothecary kind of vibe to their logo which would mirror the 1940's architecture in the building where their office is located. FiG developed several logo concepts to embody the personality of the brand. Wayfarer on the path to body wellness. Concept 2: Interlocking Gears or Parts. The body is a fully integrated system, one part out of or in a funk leads to problems in another. Concept 3: Grid or Coordinates. Indicating pin-point precision, the grid or coordinates cross-sector and identify the exact location and cause of pain. Nerve Pathways or Map. The neurological pathways in the human body are much like a map to be used as a pathology guide to the renewal of the body. This is to signify the overcoming of the pain that is interfering with optimal living. Wayfare Wellness liked Concepts 3 and 4. We refined these two concepts into a compelling logo that fits their brand image. 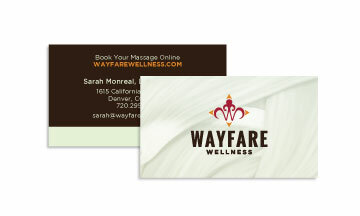 Once the name and logo were approved, we created a business card for Wayfare Wellness. The business card is consistent with the overarching identity of the old apothecary feel. The FiG design and production team is currently working on a direct mail piece for Wayfare Wellness to bring new clients in the door. Later we will produce and implement an email marketing campaign. It's always a thrill for us to brand a new business and see the results it brings to the client. Stay tuned for a case study later in the year on how Wayfare Wellness' direct mail campaigns boosted their revenues. Do you need help defining your brand? Contact us to discuss how we can help you build your business.